As anyone who has ever embarked on a kitchen renovation can attest, redesigning a small space can be very challenging. 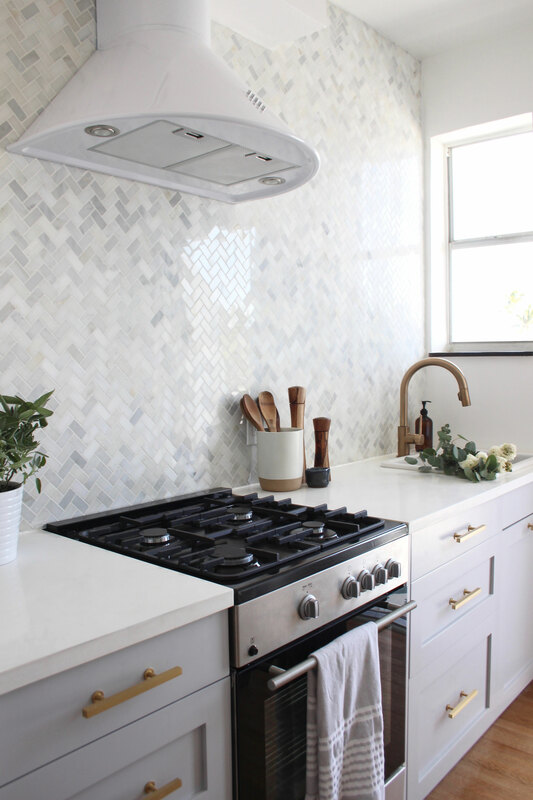 In Ian and Laura Grieg’s petite 67 sq ft Miami Beach kitchen, careful use of space has opened up their dated, dark kitchen and transformed it into an elegant gem. When the Griegs first set about their Miami Beach kitchen renovation, letting in natural light and creating a sense of balance was key. The existing kitchen at only 67ft2 to play with, had an extractor hood right in front of the only natural light source and with nonstandard entrances into the room, installing a line of flush cupboards proved tricky. 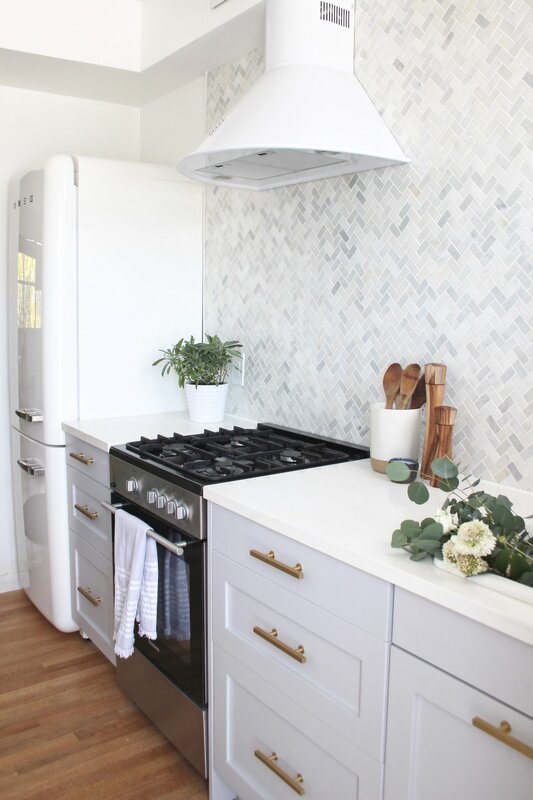 However, with some carefully considered planning, the new design enabled them to relocate appliances to create more storage and include a much-wanted dishwasher. The new plans promised a much more aesthetically pleasing layout – ready to install the beautiful kitchen they dreamed of. The fashionable contrast of natural wood flooring and neutral colours works so well in this kitchen. 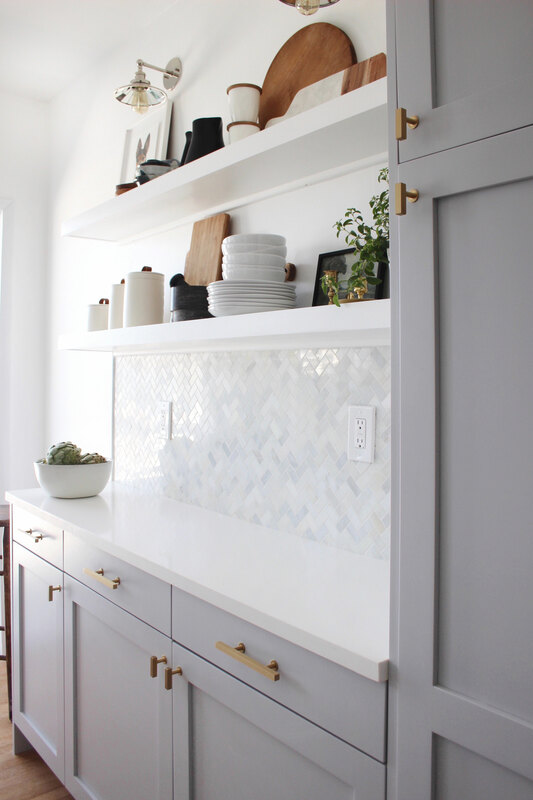 Since our DIY panels can be painted in any color, the Griegs decided to go with Semihandmade DIY Shaker Panels in a neutral light grey. Finished with contemporary brushed brass door hardware, they’ve really managed to bring in a sense of the sea with this stylish pebble shade with cool marble tiles that stretch from the worktop to the ceiling. And you can’t go wrong with that SMEG fridge. 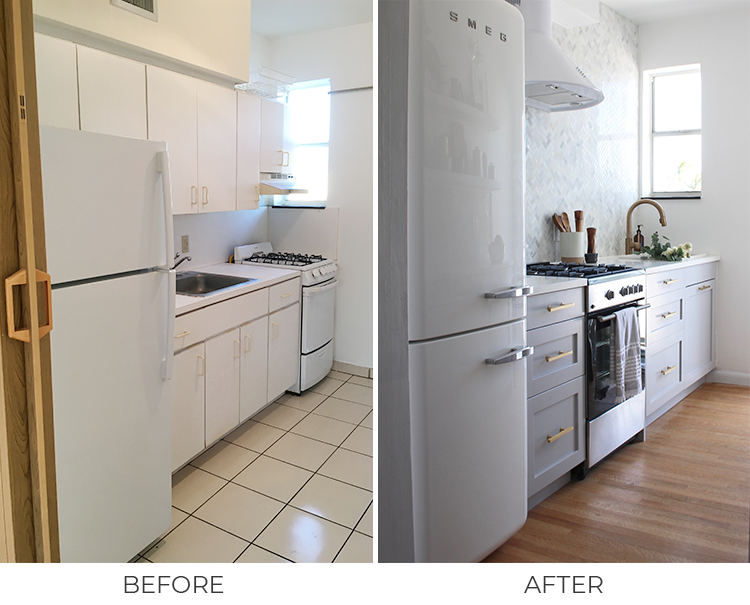 Our Miami owners even found room for a dishwasher in their new kitchen by disguising it behind an appliance panel in the same shaker style. Making appliances “disappear” is a great style trick to deploy in a small space, adding flow to prevent the room feeling over-crowded by electrical items. Eradicating overhead units and using on-trend floating shelving can help further with this. Using shelves in the same shade as the walls helps create the illusion of space where the room footprint is small. Not everyone realizes that we also carry floating shelf options, perfect for opening up tight spaces. 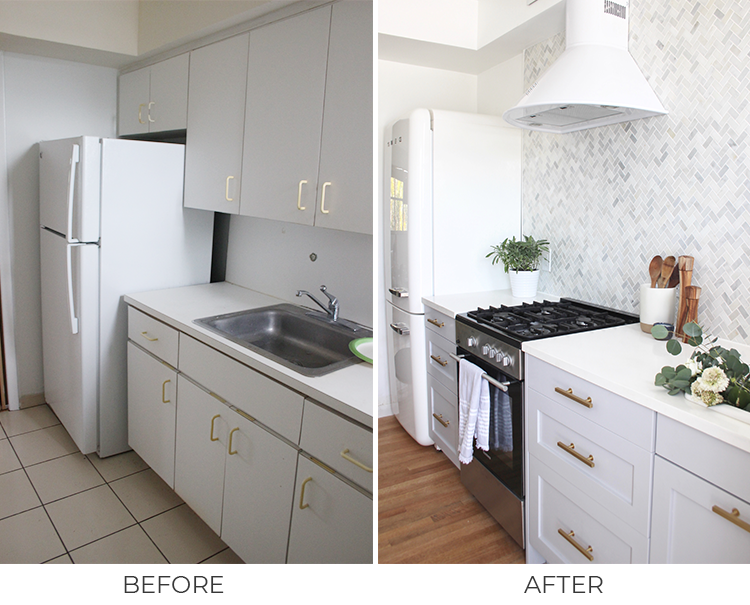 What our owners learned from this small kitchen transformation is that size really isn’t everything! A major positive of the beach house’s small proportions meant the owners could achieve the impeccable streamlined finish they wanted without compromise. 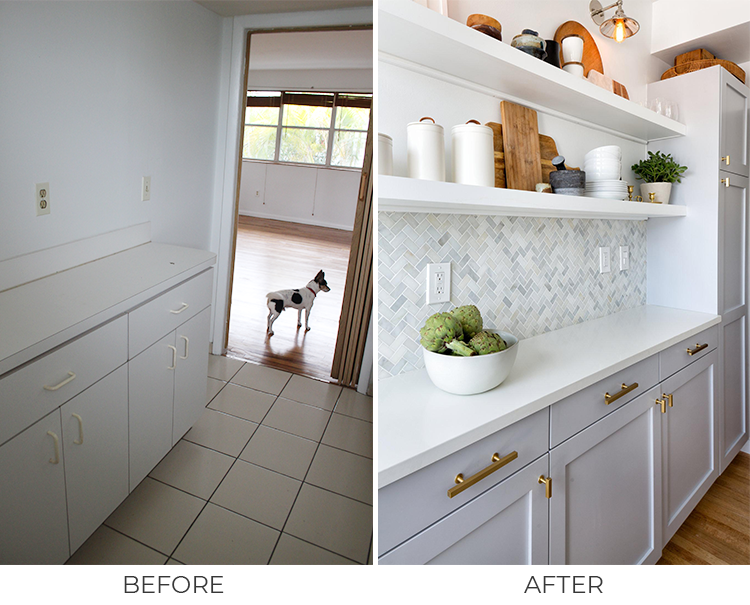 Streamlining the layout and keeping the colors neutral has transformed this awkward space into a stylish, contemporary kitchen with ample light and space. For more kitchen inspiration click here!